Multiple Game Modes (Classic, Time Trial, and Waves). Simple Mechanics (Click to Interact). Dynamic Circle Sizes and Locations. Developed solely by Devin Sherry. 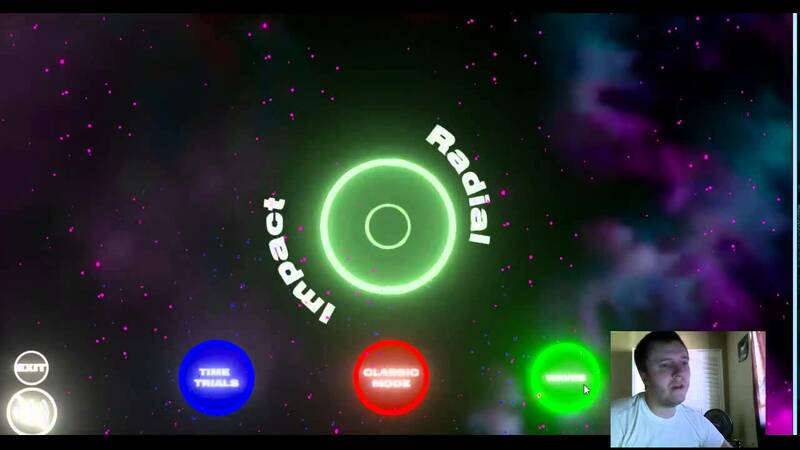 Radial Impact is a fast-paced, single-player game that challenges players’ reflexes by matching the sizes of two circles; one static and one dynamic. Game-play focused on getting the highest score. Points earned based on how close the player matches the shape of the circles. Three Lives – Once all lives are lost, the player loses and the game ends. Slow-down ability unlocked if the player gets a Perfect rating 5x in a row. If the player reaches a 10X Perfect multiplier, they earn back a life if one was lost. Lives are lost if the player gets either a Bad or a Miss rating. Saved Data for High Score. Game-play focused on lasting the longest without time running out. Time is added and subtracted based on how close the player matches the shape of the circles. The player starts with 59 seconds until the game ends. Saved Data for Longest Time. The goal of the player is to earn a score that is larger than the “Score to Beat” for each waves option and set there own high score. There are multiple “Waves” options for the player to choose from. There are 5 Waves, 10 Waves, 25 Waves, and 50 Waves. A “Wave” consists of one turn of the player matching the two circles shapes. At the start, only the “5 Waves” mode is unlocked for the player. As the player scores higher than the “Score to Beat” the player will unlock the higher waves options. Saved Data to track which waves options have been unlocked. I love game like Super hexagon and like this , great tutorials series too. Where can I download the assets used in the tutorials? Last edited by Alexotronic; 04-02-2015, 02:39 AM. Or I'm just being dumb and can't figure something simple out!